Les Batons is a gathering of friends who are passionate about traditional French & Breton music and dance. 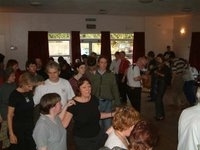 We began in October 2001 and usually have around 50 dancers and musicians at our Sunday afternoon dances. Les Batons is non profit making. Everyone is welcome to come and join us. No experience or partners are needed; we will show you how to dance and all our regulars will be pleased to dance with you and help you find your feet. Above all our afternoons are about meeting friends, enjoying the music and dance, and having FUN. Tea and coffee are provided and there are two pubs adjacent to the hall where you can get food and drink.